This top of the line pistol-grip control for the Sony PXW-X200, PMW-300, -200, -EX1 and -EX3 utilizes the finest components and has a beautifully machined aluminum housing and articulated clamp. The dual-variable circuit allows for the finest degree of zoom speed control. VariZoom is proud to offer the first zoom controller of its kind for the PMW-EX1, PMW-EX3 and PMW-200 & -160. 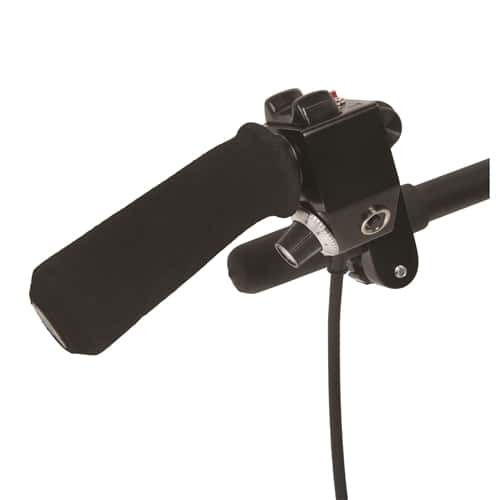 The VZ PG-EX Lens Zoom Camera Control provides remote zoom control for the Sony PMW-300, -200, -EX1 and -EX3 professional video cameras and it will clamp to any tripod handle, jib, or support bar. The PG-EX features precise control of zoom speed, comfortable grip, and a heavy-duty aluminum housing.